﻿ CMFRI, ISRO sign MoU for mapping smaller wetlands . CMFRI, ISRO sign MoU for mapping smaller wetlands. The Central Marine Fisheries Research Institute (CMFRI) and the Indian Space Research Organisation (ISRO) have joined together to map, validate and protect smaller wetlands in coastal region aimed at restoring them through coastal livelihood programmes. 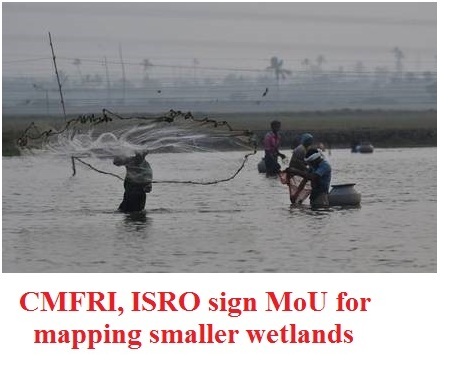 An MoU has been signed between the CMFRI and the Space Applications Centre (SAC) of the ISRO to develop a mobile app and a centralised web portal with a complete database of wetlands that are smaller than 2.25 hectares in the country. Such smaller wetlands cover an area of more than five lakh hectares across the country, with Kerala having as many as 2592 smaller wetlands. The two scientific institutes aim to identify and demarcate wetlands, and restore the degraded wetlands through suitable livelihood options like coastal aquaculture. The app will be used for real-time monitoring of the wetlands and giving advisories to stakeholders and coastal people. The collaborative move is part of a national framework for fisheries and wetlands recently developed by the national innovations in climate resilient agriculture (NICRA) project of CMFRI. The NICRA project aims to find ways and means to mitigate the impact of climate change in marine fisheries and coastal region..
Dr P U Zacharia, principal scientist and principal investigator, NICRA project of CMFRI said the real-time data of demarcated coastal wetlands would greatly help developing a conservation plan for degraded wetlands in the region besides utilising these resources for livelihood prospects such as shrimp and crab farming in the area. “Smaller wetlands across the country are highly in neglected state owing to multiple reasons.